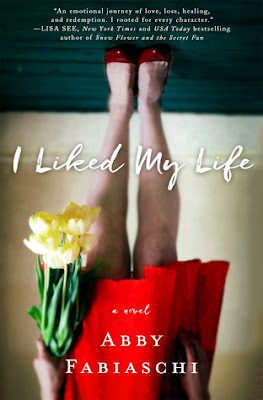 I Liked my Life is the debut novel from Abby Fabiaschi and it's a fantastic book. The book is told from three main characters - Maddy, a wife and mother who is devoted to her family but has committed suicide before the book starts. Even though she is dead, she still tries to control things that happen in her family's lives. Her family is her husband Brady, who has spent too much time at work and not enough time at home over the years and their teenage daughter Eve, who can't comprehend life without her mother. Maddy's main goal is to find a woman to be the perfect wife and mother to help her family heal from her death. I know that this sounds like a really sad novel and it is in part, especially when dealing with Eve's grief over the loss of her mother but it is also very uplifting to see the family start to heal from their loss and to see the growth in the characters. I loved the characters in this novel and I love the way that the author reveals the story through these characters. This was a fantastic book and I had trouble putting it down once I started. Add this to your to-read list for January. You don't want to miss it. Note: Twenty percent of all Abby’s after-tax profit— including foreign and film rights— are donated to charities uplifting women and children around the world. No exceptions. No fine print. Actually, I searched for charity site, some small charity as I cannot afford spending much money on it. My search engine offered me this link and I was surprised, but then saw what the matter was. I’ve ordered the book in 2 reasons, the 1st is that some money will go for charity, this is what I was looking for, and the 2nd is the book itself. I like such stories. Also, the fact that this is the debut says that I will help a new author.